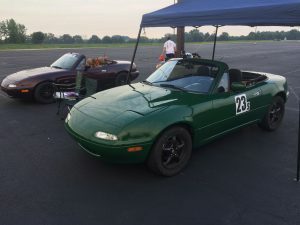 Cincinnati Region SCCA hosted Point Event #5 at Wilmington Airpark Lot. This was a last minute change of the venue due to the scheduling conflict at Turfway, but it all came out very well. The course was fun and fast, and my car was behaving very well. Unfortunately, I forgot to record the video on my 2nd run, which was a better run of two I got on his car.